Ages ago I bought an Iomega ix2-200 two bay NAS with twin 2TB drives in RAID-1 mirror configuration. A year or so ago I discovered that one drive had failed. 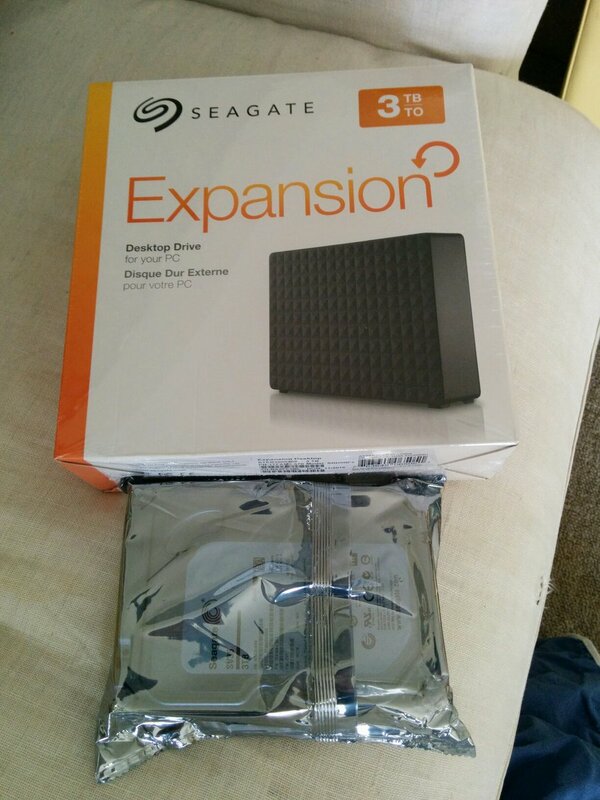 I drove direct to a supplier and bought a 3TB drive of a comparable nature. Installed, and prayed to the gods of storage that the array rebuild completed before the second one failed. It did. Sweat wiped from brow, I enabled email warnings and went back to ignoring it. Every time there's a power cut I get an email. That's all, so far. But hard disks being hard disks... one of them is bound to fail some time, likely the old original one now that they're mismatched. Given how nervous a mirror setup makes me feel when one fails with no other backup... my plan is to add another 3TB drive to the array via USB. My other plan is to replace the not-yet-failed 2TB drive with another 3TB drive and scale up the storage into the unused 1 gig. My final plan is to extract all the info from my still-working USB 2TB drive and get that into the mirrored NAS storage. That'll leave me with one happy external 2TB general purpose drive for moving big bits of data around, and one 3-way RAID-1 mirror NAS which I'm unlikely to be made nervous by. Not a bad place to be. Unlike now. File systems are XFS inside LVM inside Linux SW RAID in mirrored mode. Root has ext2 mirrored FS for other stuff. Firmware lives on some flash on the main board. Although I don't care about speed much, I'm not sure it's a great idea to have a third drive over USB as it'll be quite a bit slower than the SATA inside, but perhaps not much slower than the LAN connection? So it's only 4.5 years old, actually! And the other drive died 2 years ago? Let's see if I can find a record of that... yep! So this is 1.5 years old, now! It was used the same day, however worth noting that the bad drive had failed possibly up to 6 months earlier. And in a week or two or less the drives will arrive and I can begin the above process of ensuring I don't lose anything! About time, really. This may represent a bit of a stuff up, though, as I may not be able to use it as the third part of a mirror. Hmmm. Still, I can get onto a fresher drive, and upgrade the size to 3TB. Then maybe just rsync the shares every once in a while. And plan to replace the older drive in a year or two, if it doesn't fail sooner. I'm 3/4 through backing up the NAS to the new USB drive over wifi and rsync/cp with a few permissions fixups and other learnings/chores along the way. That should finish sometime today or tomorrow.